YUM is back again, next Friday at Asiento! 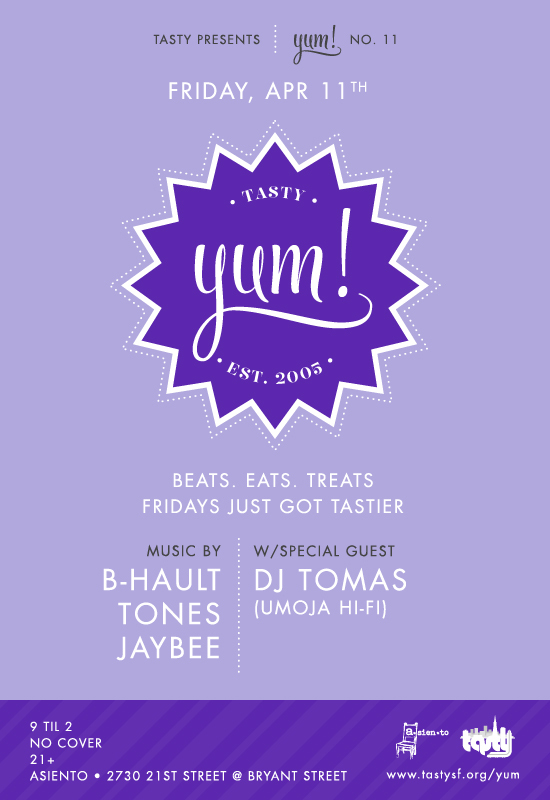 We’re stoked to have DJ Tomas (Umoja Hi-Fi) join us this month along with Tasty resident B-Haul, Tones and Jaybee. It’s also Jaybee’s Bday, come see him while you still can! and special guest DJ Tomas! This entry was posted in @Tones, B-Haul, DJs, Events, jaybee, yum! on April 4, 2014 by Amit Verma. You know nothing Jon Snow, winter is just about GONE. The sun’s up earlier, the rain’s running out, and St. Paddy’s is round the corner. Come and shake off yer hibernation at the March edition of YUM! 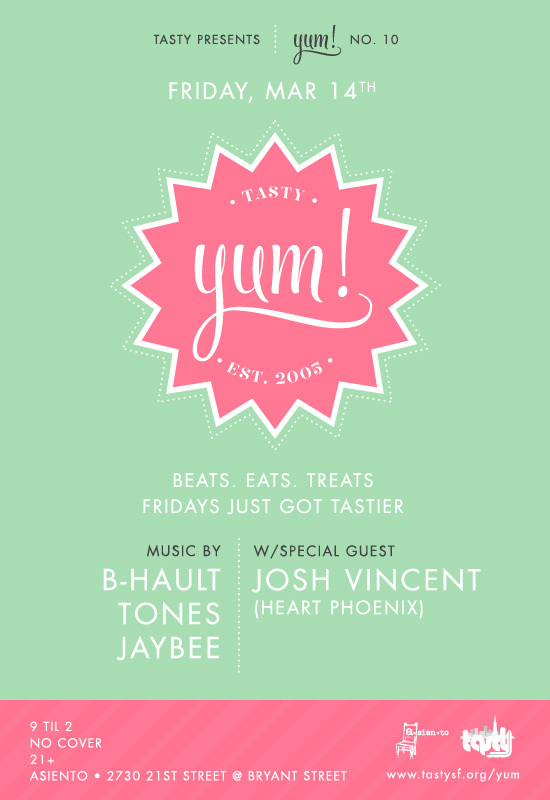 This month featuring special guest Josh Vincent aka Extra Jam, plus Tasty residents B-Haul, Tones, and Jaybee. and special guest Josh Vincent! 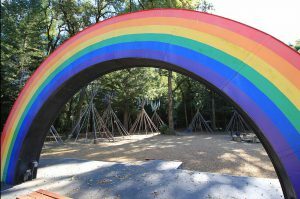 This entry was posted in @Tones, B-Haul, DJs, Events, jaybee, yum! on March 13, 2014 by Amit Verma. YUM! is back in action for 2014 with a special Valentine’s Day edition! 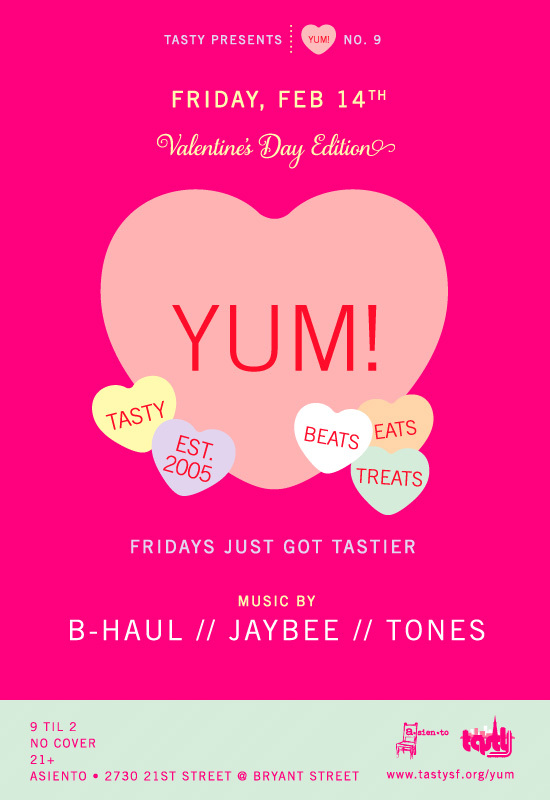 Your resident DJs Jaybee, Tones, and B-Haul will be heating up the room with an ALL LOVE JAMS edition in their own inimitable style and will be taking requests. And we’ve got a special champagne & tapas pairing! What better way to spend the night than with Tasty at your favorite DJ lounge? Fly solo, steady, or somewhere in between, no matter what YUM! will be ready to rock your world! * 2 glasses of champagne & 2 tapas & dessert for $25! * Song dedications taken by commenting on the Facebook invite! This entry was posted in @Tones, B-Haul, B-Haul, DJs, Events, jaybee, yum! on February 14, 2014 by Amit Verma. YUM just keeps gettin Tastier! When yer Halloween candy runs out, swing by Asiento next Friday and stock up on Tasty treats from B-Haul and Jaybee plus new kid A.M. Rebel! and special guest A.M. Rebel! This entry was posted in B-Haul, jaybee, yum! on November 6, 2013 by Amit Verma. I gotta say, we’re doing the Indian Summer right. Let’s keep the Tasty times rolling friends! 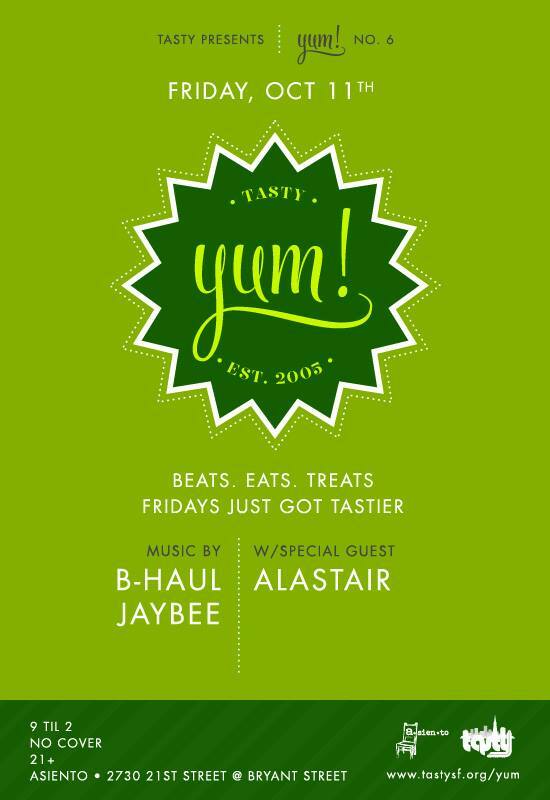 This entry was posted in B-Haul, DJs, Events, jaybee, yum! on October 8, 2013 by Amit Verma. The man has burned but the summer is far from over! Let’s rendezvous this Friday evening to celebrate and decompress. Expect tasty drinks, delicious music and awesome peoples. Beats provided by special guests Jen Woolfe and DJ Loryn, with support from residents Jaybee and Tones. This entry was posted in @Tones, DJs, Events, jaybee, yum! and tagged jen woolfe, loryn on September 11, 2013 by Amit Verma. In two days after a long hiatus, Tasty will be open for business once again! We’ve sourced the freshest eats and foraged the hottest beats for your Saturday afternoon pleasure. And we’re hoping you’ll be complementing that with your own delectable dishes to share. We’ll have a grill for you to use, coolers for you to share some drinks. Chef Keme is inheriting the reins and will be serving up the famed Tasty fried chicken for y’all! 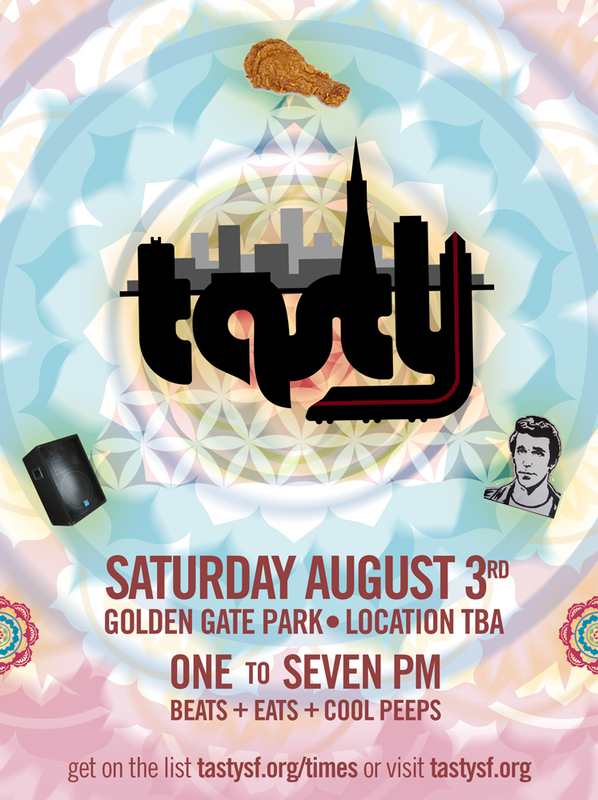 Please remember, Tasty is a potluck and BYOB affair for our friends and yours! Bring everything you need to serve it up right! And leave no trace. -Tasty doesn’t work without your POTLUCK contributions! -Tasty is for old farts, little ‘uns, young pups, clowns and lovers. That means you and yours. -Help us reduce waste by bringing your own cup/bowl/plate/utensils. And pack out your trash! -Believe in the power of the Filipino Fried Chicken. -Please do not forward to any lists. Enter Golden Gate park from 41st and Lincoln onto Chain of Lakes Drive. Pass MLK drive and go straight on Chain of Lakes. You will soon pass a parking lot on your right (park there if driving). Just a little ways north of the lot there will be a small dirt path to your right, just before a bright yellow wildlife crossing sign. Take the path and you will come to a nice sized clearing where we will be. You can alternatively find the spot by taking the path to the right at the NE corner of the parking lot and make a left at the next path you see. DJ-driven beats from across the musical spectrum, delectable eats from our resident chefs, laidback afternoons in Golden Gate Park spent with our friends and family and yours, a picnic potluck where we encourage you to contribute something of your own creation, a damn fine time. This entry was posted in @Tones, B-Haul, B-Haul, DJs, Events, jaybee, Pecko on August 2, 2013 by Amit Verma.